Menu. Use the menu to configure channel strips. You can filter the display of specific channel strip types and modules within channel strips. For details, see Console view menu and To show/hide specific tracks, buses and hardware outputs. Track, Bus and Hardware Output panes. 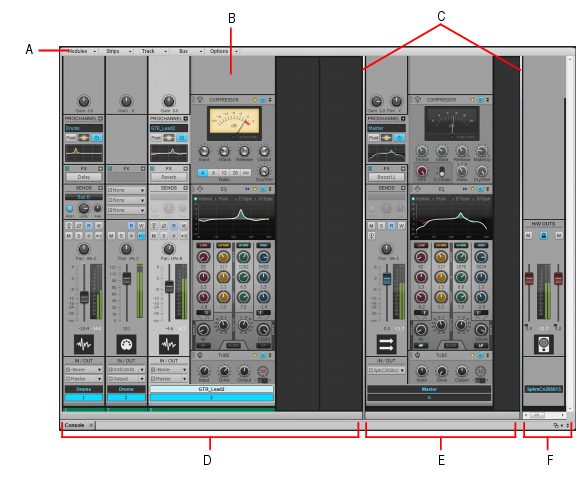 The Console view has three separate panes: the left most pane contains track channel strips, the middle pane contains bus channel strips, and the right pane contains hardware output channel strips. You can drag the pane splitter bars to resize the panes. Channel strips. Each track, bus and hardware output in the project is represented by its own vertical channel strip. Use the channel strip controls to mix and process tracks, buses and hardware outputs. For details, see Channel strips. Modules. Controls in channel strips are grouped into modules that can be shown or hidden. For details, see Modules. Figure 650. The Console view.